Toasted flakes of corn, fortified with vitamins and iron. 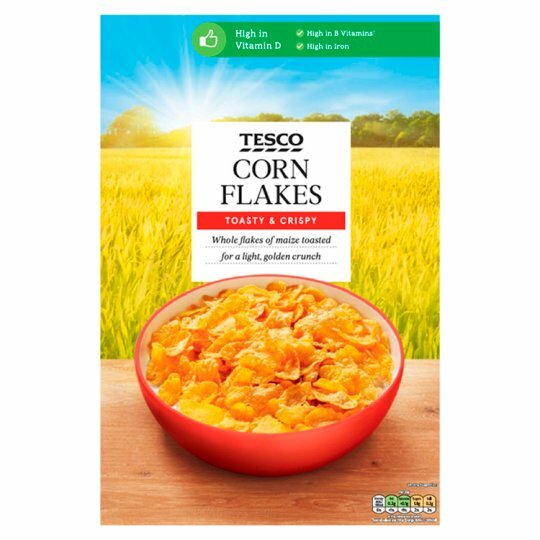 TOASTY & CRISPY Whole flakes of maize toasted for a light, golden crunch. We love breakfast. That’s why we only work with partners who take pride in what they do and select the most flavourful grains for your cereals – like they’ve been doing for decades. Maize, Sugar, Salt, Dextrose, Barley Malt Extract, Iron, Niacin, Pantothenic Acid, Vitamin B6, Riboflavin, Thiamin, Folic Acid, Vitamin D, Vitamin B12. Store in a cool, dry, odour free place., To retain freshness fold down inner bag after use., Contents may settle during transit.